Hearings for the debate on whether student athletes should have the right to collectively bargain their rights coincides with friends and family paying their respects to the former Maryland football player on the day he would have turned 20. WASHINGTON — His best friend on the team and a few other guys met up with the young man's parents on Sunday, communing in the only place they could to celebrate Jordan McNair's birthday: King Memorial Park in Windsor Hill, in the cemetery where he is buried. Ellis McKennie said they all stood at Jordan's grave site, "shared a few stories and just chatted for a few hours." He added that it went well. Jordan McNair would have turned 20 years old yesterday. 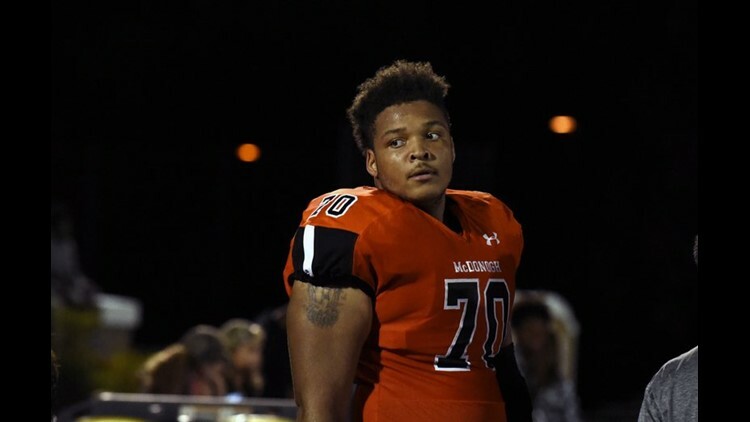 McNair, of course, is the University of Maryland sophomore lineman who died two weeks after collapsing at football practice last summer in College Park. Between lack of water or rest, a warped football culture and a medical staff responding 20-30 minutes too late, it was a tragic death that captured national attention -- a death the school finally acknowledged after months of tone-deaf lawyerspeak was preventable. Let me repeat that: It’s Never The Wrong Time To Do What’s Right. “The State Higher Education Labor Relations Board [would be required] to adopt regulations authorizing and establishing the process for collective bargaining for student athletes on or before July 1, 2020." Imagine that, giving student athletes – many of whom play Division I college football and basketball and raise much more money for their institutions than any paid university employee -- actual rights and say in their time as indentured servants for their schools. And don’t be naïve – from Zion Williamson at Duke to Bruno Fernando at Maryland – that’s what they are: unpaid interns who can’t wait to turn pro and cash in on their talents; just as a kid destined for M.I.T. can’t wait to graduate and work for NASA. There should be no shame in that. When Williamson’s Nike shoe exploded two weeks ago in the opening minute of a primetime Duke-North Carolina matchup, it became a metaphor for the illusion and hypocrisy of amateurism among college athletics. The No. 1 player in America, projected to be the No. 1 pick in June’s NBA Draft, never went to Durham for the value of a Duke education; he went to improve the Zion Williamson brand by playing for the most prominent coach in college basketball at a perennial hoop powerhouse – an institution of higher profits, whereby Coach Mike Krzyzewski is allowed to make $8.89 million a year, Duke is allowed to enter into a multi-million, 15-year endorsement contract extension with Nike but Williamson and the players most responsible for those victories are not allowed to earn a dime. Because, heaven forbid any prominent athlete playing for a revenue-generating program gets more than the “value of a Duke education” – a rich campus life Williamson will have taken part of for all of eight months before he bolts for the NBA. Which is fine. Let's just admit what it is: free marketing for the NBA and colossal profits for power-conference schools whose stadiums and arenas are actually cash registers designed to fill the university's coffers. Northwestern’s football players unsuccessfully tried to unionize five years ago, their quarterback at the time Cain Kolter taking his case nationally. They weren’t looking for their piece of the pie; they just wanted to ensure they were taken care of if anything catastrophic happened. Something like, yes, the death of a player from a program that had no business operating the way it did. It’s unclear whether Maryland elected officials will connect the dots and realize the importance of such a bill; already it’s being talked about as a long shot. Still, McKennie wrote when we went back and forth on text Monday night, "the amount of support and attention this bill has received is an extremely encouraging sign for future student athletes." It’d be more than nice. It’d be another courageous way of memorializing a Maryland football player who needlessly died. Jordan McNair, a friend, a son, a kid just trying to get an education with a football scholarship. "It would mean he did not pass in vain," McKennie wrote. "His life made such an impact that it affected people to shape policy and change the way things operate for years to come."